There are spring beginnings all around us here at Pot Hole Farm. The daffodils are in bloom and we noticed small buds forming on tree branches. The bluebird is checking out the bird house and our annual Phoebe is rebuilding her nest on the gutter downspout. A few days ago Sonny was able to plow the garden and today we planted two rows of kale and a row of mixed lettuce greens. We finally built the turkeys a house and pen last week and not a minute too soon. Our turkey girl made herself a nest in the soft hay and laid her first egg. Its not much bigger than a chicken egg, but give the girl a break its her first. 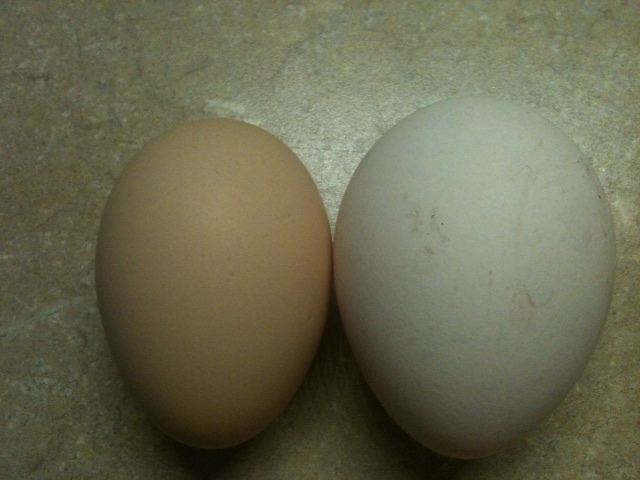 Turkey egg is the white egg. Well we bit the bullet and invested in an outdoor wood furnace to heat the house. We finally got tired of the smoke the indoor wood stove liked puff out every time we tried to reload it with wood. Both of us grew up with wood stoves and a little puff of smoke is normal, but these new EPA regulated stoves are horrible. We are not the first to have this problem and have read complaints on other blogs. This outside wood furnace should do the trick. I know some of you are curious to know how this furnace works so Sonny will do an update later and will be able to answer any questions you may have. You would only be confused if I attempted to explain it. Outdoor wood furnace is only set in place. There is much more that needs to be done. 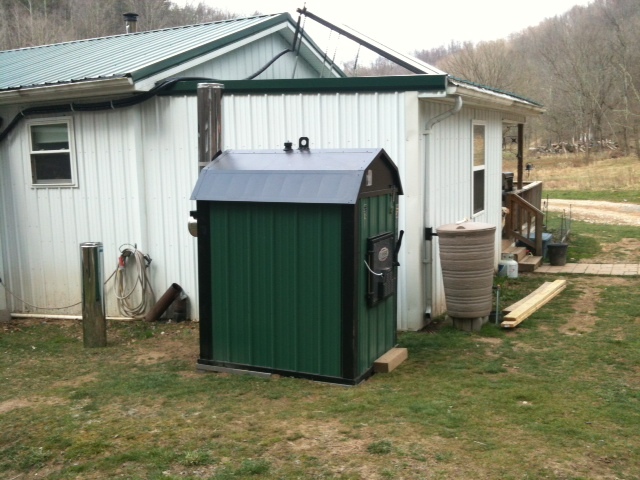 You are currently browsing the Off-Grid in West Virginia blog archives for April, 2013.